The kids are loving BrainPop! 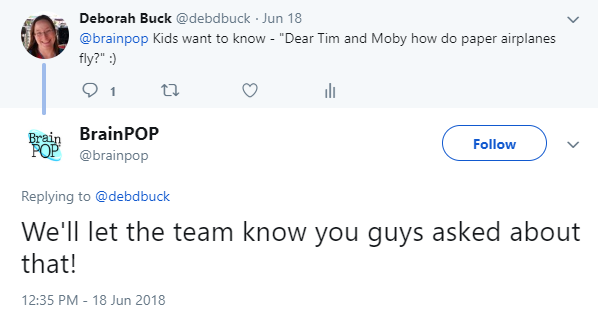 They came to me the other day wanting to ask Tim and Moby a question. I didn’t really know how to do that but then had a fun idea. I tweeted their questions. 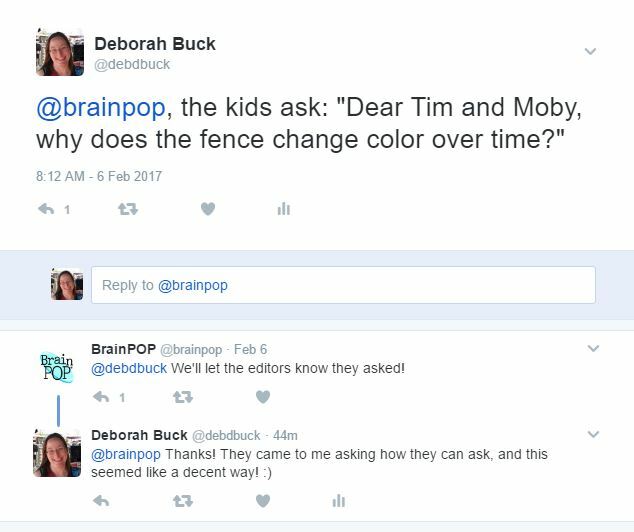 The kids are tickled pink that BrainPop responded! Thanks, Twitter and BrainPop! *Don’t pay full price for BrainPop if you don’t have to! You can get a great discount through the Homeschool Buyers Co-Op. That’s what I did! Since then, they’ve learned a ton about various very relevant topics including ADHD and Juvenile Idiopathic Arthritis. It took me a little while there to get your comment, but I did get it and passed it along. I updated my post with their response. Thank you for your comment!